Point Pleasant sophomore Hunter Bush (23) drives around a Hannan defender during the second half of a Jan. 11 boys basketball contest in Point Pleasant, W.Va.
POINT PLEASANT, W.Va. — This type of 13 should never be unlucky. 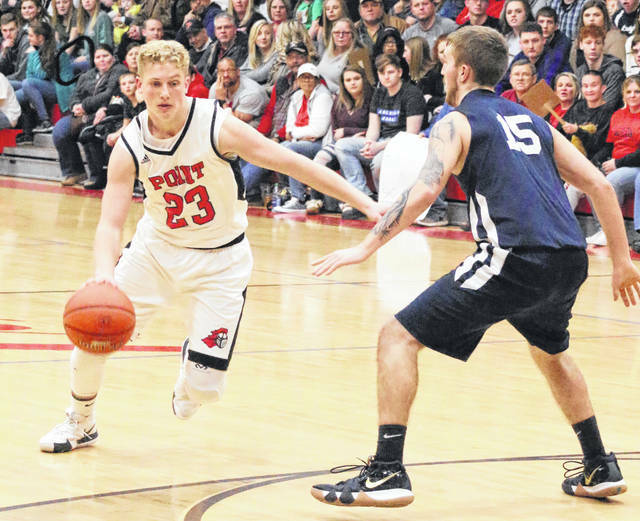 The Point Pleasant boys basketball team nailed a baker’s dozen-worth of trfiectas, but visiting Calvary Baptist Academy somehow managed the storm and ultimately came away with a 66-53 victory on Thursday night during a non-conference matchup in The Dungeon in Mason County. The host Big Blacks (2-8) hit at least three 3-pointers in each of the four periods of play, but the Patriots (13-4) managed to keep pace with three triples in each of the first three cantos while building a slim 43-40 edge headed into the finale. The difference, however, proved to come from 2-point range down the stretch as CBA hit seven of the eight 2-point field goals during a pivotal 23-13 surge that ultimately allowed the guests to wrap up the 13-point outcome. The victory also gave Calvary Baptist a season sweep of the Red and Black after posting a 74-37 win in Sissonville back on Dec. 18, 2018. Aiden Sang poured in six points in each of the first two frames, helping Point build a 16-13 first quarter advantage before entering the break down 28-27. Hunter Bush tacked on five points in the third frame, but the Patriots made a 15-13 spurt during that span to extend their lead out to 43-40 entering the stretch run. Bush added five points in the fourth, but Robert Clutter poured in eight points as part of a 23-13 surge at the end. The Big Blacks made 18 total field goals — including just five 2-pointers — while also going 4-of-8 at the free throw line for 50 percent. Bush paced the hosts with 18 points and Sang chipped in 15 points, followed by Braxton Yates with a dozen markers. Kyelar Morrow completed Point’s tally with eight points. Calvary Baptist Academy netted 22 total field goals — including 10 3-pointers — and also went 12-of-18 at the charity stripe for 67 percent. Issac Massie led the guests with a game-high 21 points, followed by Clutter with 17 points and Scottie Parsons with 11 markers. Luke Pauley also reached double figures with 10 points. Jordan Ruby was next with five points, while Lawson Blake finished off the winning total with two points. Point Pleasant was at Ravenswood on Friday and returns to action Tuesday when it travels to Meigs County for a non-conference contest with Eastern at 6 p.m.